Baller bands, otherwise known as silicone wristbands, were made famous by NBA players promoting causes, and by cyclist Lance Armstrong as he raised money to fight cancer. This popular, unisex bracelet can be used for fund raising and boosting social awareness or simply for self-expression. Creating custom bands from scratch requires skilled craftsmanship and a few tools. 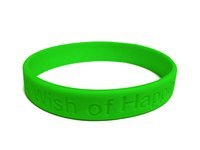 You can also order custom bands online through a variety of outlets that allow you to choose your favorite colors and write your own messages. Cast or buy a bracelet mold. Resin molds are inexpensive and usually come in standard round shapes. To create your own mold, purchase jewelry wax and carve out a 1/2 inch relief creating a round, hollow shape with wax at the bottom so the hot silicone won't stick to your workspace. Draft your message on the outermost ring of the hollowed mold with a pen before going over it with a sharp X-Acto knife. Carve out your message with block letters just slightly to create subtle embossing. Heat the silicone base with your desired coloring and catalyst. Depending on the type of silicone base that you use, the heating instructions will differ. Pour your mixture into the mold and let it sit for the time indicated on the silicone container. Most silicone batches take about a day to properly set. Remove the band from your resin or wax mold when the silicone is completely dry. It should either fall out or your can fish it out with the X-Acto knife. Be careful not to rupture the smooth surface.